Fun and beautiful stationery for all your letter-writing needs! Colorful and fun stationery paper is a great way to show your personality when you write letters! And since Leanin' Tree's stationery is laser-printer compatible, each letter you print will be crisp and clean! 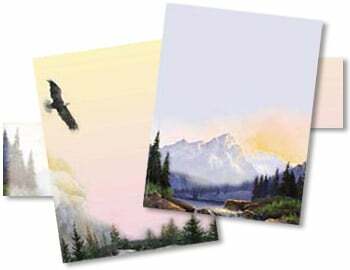 Printed in rich detail on fine-quality, acid-free paper, you'll enjoy writing letters as much as your friends and loved ones will enjoy receiving them! Letter Size: 8 ½" x 11"